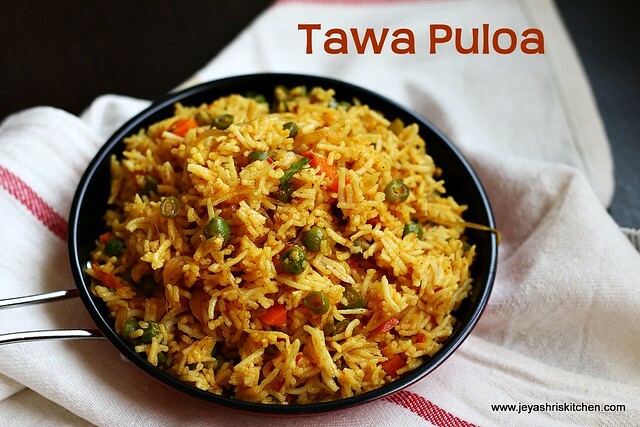 Tawa pulao i wanted to try for a long time , and finally made this for dinner last week. 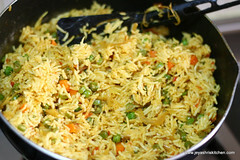 It is a popular Mumbai street food. 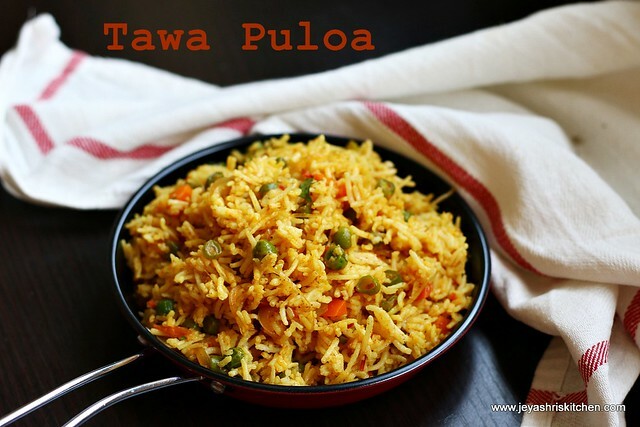 Tawa puloa was a super hit at my home. It is a super easy one pot meal , perfect for lunch box too. Making of this tawa puloa doesn't involve any grinding. 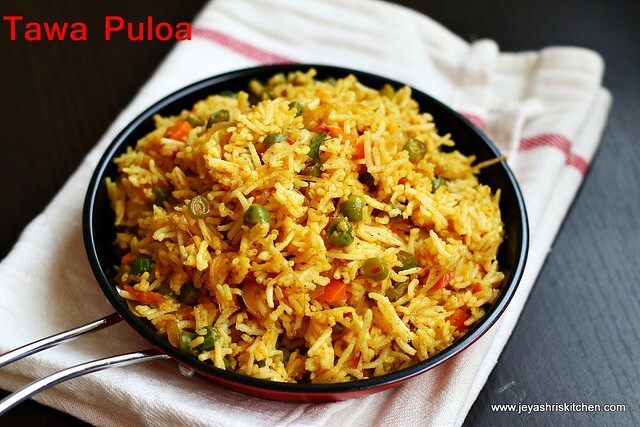 Try out this easy pulao for lunch or dinner , enjoy with a simple raita. *I used carrots,beans and peas. You can add cauliflower too. Soak the rice for 20 minutes in 1 and 1/2 cup of water. Cook the rice by adding little oil and little salt. Spread the rice in a wide plate and keep it aside. 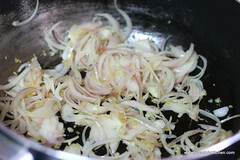 In a pan add oil and add the ginger garlic paste.Slice the onions into long. 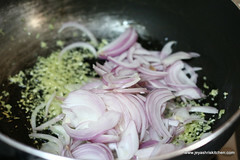 Add the onions to this and saute well. 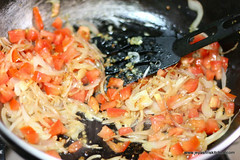 Add the finely chopped tomato and saute well. 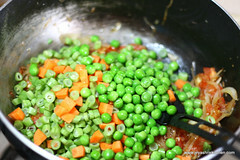 When the tomatoes are mushy add the mixed veggies to this. You can parboil the veggies in microwave too. 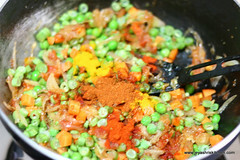 Add salt, turmeric powder, pav bhaji masala,and red chilly powder and cumin powder. Mix well and cook in a low flame till the veggies gets cooked. Add the cooked rice once the veggies are cooked. Mix gently and cook for 2 -3 minutes in a low flame. Do not cook the rice mushy.It should be separate long grains. You can add bell peppers too . Generally jeera is added while tempering, but since i forgot i added jeera powder. 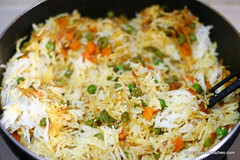 Nice pics and the pulao looks delicious..
delicious pulao!! love the first click and the vessel in which it is served - perfect!!! Never get bore of this one pot meal,my favourite anytime. Will try this tonight! 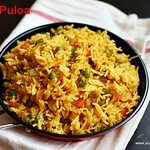 Spelling of Pulao on the pics is Puloa - just thought i'd point in out. 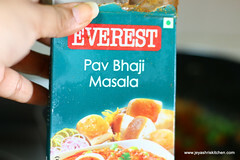 can we boil the veggies first and then add them into masala ? Hi jeyashri. It has come out well. Very tasty. Thanks for sharing the recipe.